The Russian Navy will hold drills in the Mediterranean Sea, near Syria, in the period from September 1 to September 8, the Russian Defense Ministry announced on August 30. 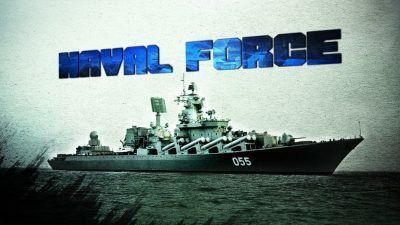 The drills will involve 25 warships led by the Marshal Ustinov missile cruiser and 30 aircraft, including the strategic Tu-160 missile-carrying bombers, the Tu-142MK and Il-38 anti-submarine warfare planes, Su-33 fighter jets and Su-30SM aircraft of naval aviation. The defense ministry said that “the grouping will practice a set of tasks of air defense, anti-submarine and anti-sabotage warfare and also mine counter-measures support”. According to Syrian experts, these drills are a response to the growing threat of a new round of US missile strikes on government facilities in Syria. On August 30, the Russian Foreign Ministry announced that the US currently has some 70 delivery vehicles with about 380 cruise missiles in the Middle East and is capable of preparing a missile-strike group for an attack against Syria in just 24 hours. The US rejects all reports that it is beforehand preparing for an attack on Syria, but says that it’s ready to act if the Assad government uses “chemical weapons”. Meanwhile, Syrian Foreign Minister and Deputy Prime Minister Walid Muallem stated that the White Helmets had kidnapped 44 children in Idlib to use in a staged chemical weapons attack in the militant-held part of the province. The minister also emphasized that the Syrian military does not possess chemical weapons and there is no need for the Syrian army to use any kind of such weapons to defeat terrorists in the country. In the area of al-Safa in southern Syria, the Syrian Army captured positions between the hill of Abu Ghanim and the and the area of Umm Marzakh thus splitting the ISIS-held pocket into two parts. Clashes are ongoing. Warplanes of the US-led coalition carried out airstrikes on several ISIS positions on the eastern bank of the Euphrates River, including the area of the al-Azraq oil field. These airstrikes are most likely a US response to the recent series of ISIS attacks on the US-backed Syrian Democratic Forces. However, while the ISIS-held pocket of Hajin on the eastern bank of the Euphrates is not cleared, these attacks can hardly be stopped any time soon. The key question is why are the US-led coalition and the SDF not hurrying up to deal with ISIS terrorists there?